Low pressure moving along a cold front will spread steady rain into the Finger Lakes by late morning. A slow moving cold front will cross the Finger Lakes this morning. Meanwhile, low pressure is developing along this front over the Appalachians. Cooler air will only slowly push east into the Finger Lakes. Temperatures that started the day in the upper 40s will slowly fall into the low 40s by the afternoon hours. This should keep the precipitation all rain during the day and into the evening hours. 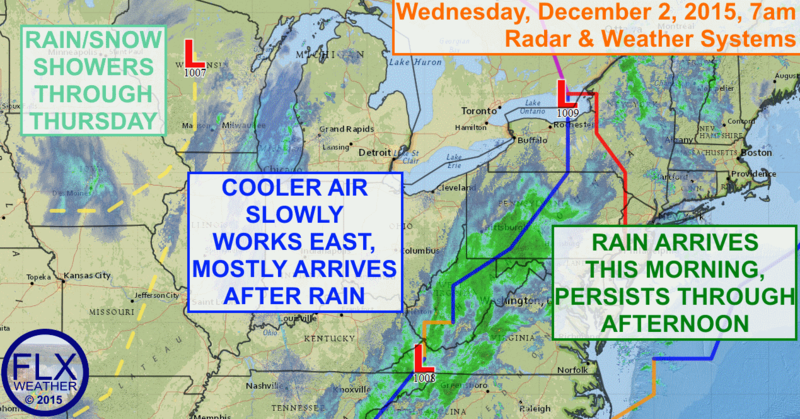 As low pressure tracks north along the front, rain will spread into the Finger Lakes. It should begin to rain during the mid to late morning hours, with precipitation persisting through the rest of the daytime. Rain will be widespread and steady. By evening, many places will have received over a half inch of rain. After the main area of rain pulls out, there will be a few widely scattered showers or flurries overnight. Precipitation may become a bit more widespread on Thursday as the upper level low pressure system moves into the neighborhood from the Midwest. The Great Lakes, too, may contribute to the shower activity. The chances for snow look greatest as the precipitation comes to an end on Thursday evening. Some of the widely scattered precipitation tonight could also mix with or change to snow. Accumulations should be limited to the higher elevations and should generally be no more than a coating. Temperatures on Thursday will struggle to reach 40 degrees for most of the region, which is right about average for early December. Temperatures will return to the mid 40s on Friday, with upper 40s Saturday and highs near 50 degrees on Sunday. High pressure will be in control, keeping the region dry. Saturday looks sunny, while clouds may hang around on Friday and Sunday.